After years of being stalled in the state Legislature, a bill that would boost the guardianship rights of family members of the developmentally disabled appears to have a chance of passage. The bill (H. 1459), which was given a hearing last week by the Judiciary Committee, states that probate court judges should presume a spouse or parent is the proper person to be the guardian of an incapacitated person. The Committee also heard testimony in support of a related bill (H. 1469), which would prohibit state or other authorities from charging a parent or legal guardian with abuse or neglect, based on the type of medical care the parent or guardian has chosen for an individual in their care. While we are primarily concerned with legislation that affects people with developmental disabilities, both bills are about the rights of families to make decisions regarding the care of their loved ones. In a number of cases, family members have been overruled in their decision-making regarding loved ones, and, in some cases, have been removed from virtually all contact with them by state or clinical authorities. Passage of the medical decision bill, dubbed “Justina’s Law,” is being sought by the family of Justina Pelletier, a teenager who spent nearly a year in a locked ward in Boston Children’s Hospital after doctors there disagreed with the family’s belief that Justina was suffering from mitochondrial disease. Even though the family was relying on a diagnosis of mitochondrial disease from a doctor at Tufts Medical Center, the Children’s Hospital doctors claimed her illness was psychological and accused Justina’s parents of medical child abuse. Member’s of Justina’s family testified last Wednesday in support of H. 1469. The impetus for the H. 1459, the bill promoting family members as guardians of the developmentally disabled, came from Stan McDonald, who has been unable to regain his guardianship of his intellectually disabled son, Andy. Stan has had to watch helplessly as Andy’s emotional needs have been ignored or neglected. Andy McDonald’s current court-appointed guardian has had as many as 100 wards at one time. H. 1459 would also potentially apply to a case in which a probate court judge dismissed several members of the Duzan family as unsuitable to continue as guardians of Sara Duzan, a young woman with a developmental disability. The judge’s order set the stage for the eventual cutoff of all contact between the family and Sara for months, and forced them into an expensive and still ongoing legal battle over her custody. A corporate provider executive director initially appointed as guardian of Sara Duzan had 24 other wards at the time, according to court records. H. 1459 would not prevent a probate judge from removing family members as guardians or denying a family member’s bid to become a guardian, but it states that there must be “competent evidence” to rebut the presumption that a parent, in particular, is the proper person to be the guardian. 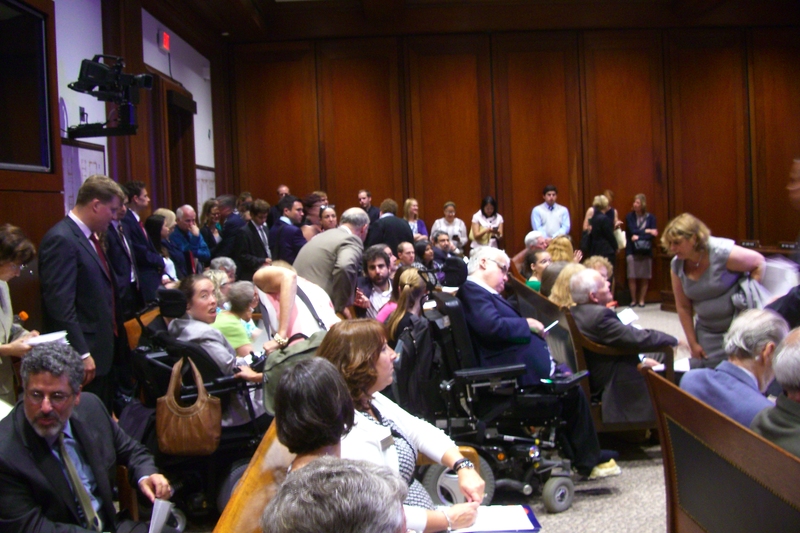 This year, H. 1459 has received support for the first time from the Massachusetts Developmental Disabilities Council (MDDC), a state-run organization that identifies priorities for care for people with those disabilities, and from the Arc of Massachusetts. The MDDC has listed the bill as one of its legislative priorities for 2015-2016. Testimony in support of H. 1459 was also submitted by COFAR and by a representative from the Institute for Community Inclusion (ICI), which is associated with the University of Massachusetts. It is unclear when the Judiciary Committee, which has had both H. 1459 and 1469 before it since January, will vote on ether one. In order to participate in the care of a developmentally disabled person, it is necessary to obtain guardianship of that person when they reach the age of 18. Guardians have legal rights to participate in individual support planning, a key element in the care of developmentally disabled persons, and to make other decisions that affect their wards’ services and well-being. In some cases, parents and siblings of incapacitated individuals are passed over by probate court judges in considering who to appoint as guardians, and, in some cases, family members are removed as guardians by judges. In many of those cases, judges appoint either attorneys or corporate human services provider organizations as guardians, and those attorneys or providers may have no connection to the persons who need their representation. Some of those court-appointed guardians have large numbers of wards and are unable to advocate for them effectively. Most court-appointed guardians for the developmentally disabled in Massachusetts appear to be paid for that work by the Department of Developmental Services. The ICI representative’s testimony characterized such payments to court-appointed guardians by state agencies as a “clear conflict of interest.” The testimony noted that guardians paid by state agencies may not always act in the best interest of the ward. This can “result in decisions to remove the family from virtually all decision-making authority in the care of their loved ones,” the testimony noted. In appointing a guardian, a probate court judge is currently required by law to consider, in order of priority, a spouse, then a parent, and then “anyone else the court deems appropriate.” But a judge is not obligated to give more weight to a parent than to anyone else he or she deems appropriate. In fact, the law currently allows judges to pass over a person having priority and appoint anyone else they wish as guardian. That provision gives probate judges carte blanche to bypass the express wishes of parents and other family members. H. 1459 would remove that bypass provision. COFAR’s testimony in support of H. 1459 suggested some changes that would strengthen it even further. Those positive changes include adding siblings to the list in the bill of suitable guardians. As the bill is currently drafted, it specifies only a spouse and parents of disabled individuals as being considered to be the proper guardian. In the case of developmentally disabled persons who are aging, siblings are often the only family members in a position to become guardians. Limiting the number of wards a court-appointed guardian can have, and requiring court-appointed guardians to devote a certain minimum amount of time to the ward and to visit them a minimum number of times. Entitling family members of a developmentally disabled individual to an attorney if the Department of Developmental Services or another agency attempts to remove them as the guardian. In many cases, families are subjected to costly legal battles to retain or regain guardianship when state agencies seek to remove their guardianship rights. Placing the legal burden on agencies such as DDS or on court-appointed guardians to prove that restrictions on family contact are in the best interest of the ward. Both COFAR and the Arc oppose a separate bill that would remove a requirement that individuals with developmental disabilities be clinically evaluated when new guardians are appointed. That bill (H. 1594) appears to be discriminatory in removing the evaluation requirement for people with intellectual disabilities but not for people with mental illness, for instance. We believe that such evaluations are necessary for all incapacitated persons, particularly when new guardians are appointed. The Department of Developmental Services is on the hook to create a national background check program that will cost the Department more than $500,000 in the current fiscal year alone and will involve background checks of tens of thousands of current and prospective staff, according to a document posted on the Department’s website. Yet DDS has continued to balk at applying for up to $3 million in federal grant funds that could help the Department develop the much delayed program. As a result, it appears DDS will have to continue to take money from departmental accounts that have been repeatedly shortchanged in terms of funding in recent years. The online document states that DDS will be responsible for national background checks of more than 20,400 current human service corporate provider staff in the state, including some 6,500 staff working directly for the Department itself. The document appears to project that DDS will do national background checks on more than 10,600 new provider staff and 1,300 new DDS staff each year. The document notes that in the current fiscal year, DDS will need a minimum of $510,000 to hire and train staff to be ready for the January 2016 implementation date for the first phase of the program, which involves undertaking background checks of new staff. Even then, it wasn’t necessary to wait to apply for the funding, under the grant rules; but that long-awaited legislation was, in fact, signed into law by then Governor Patrick last August. Yet, on May 1 of this year, some nine months after the bill was signed, DDS was still considering whether to apply for the grant, according to a letter sent to us by the DDS general counsel. As of May 27, the matter was still under consideration, according to a follow-up letter from a DDS assistant general counsel. This is a year in which DDS Commissioner Elin Howe has said the Department has had to deal with “huge and difficult (budget) reductions.” It would seem that the Department doesn’t have the luxury to spend months thinking about whether to accept federal assistance in paying for the development of a new, required program. It’s not even a competitive grant, meaning it appears to be practically guaranteed money. A total of 24 states and Puerto Rico have been awarded close to $57 million in this funding. Thus far, Massachusetts is among 26 states that still haven’t applied for the grants. The state legislation signed in August authorizes DDS to conduct national criminal background checks of persons hired to work in an unsupervised capacity with individuals with developmental disabilities. The law will ultimately require that both current and prospective caregivers in the DDS system submit their fingerprints to a federal database maintained by the FBI. The law applies to DDS employees, employees of corporate service providers to the department, and caregivers over the age of 15 of persons living at home. Up to now, persons hired to care for clients in the DDS system have had to submit only to an in-state criminal background or CORI check, which identifies only criminal arrests and convictions in Massachusetts. CORI checks do not identify any convictions a job applicant might have from another state. The new national background check requirements will not fully take effect until January 2019 for current employees, and until January 2016 for new employees. As we have noted a number of times, neither the Legislature nor the administration of then Governor Deval Patrick appeared to place a priority on getting the new program up and running quickly. That lack of urgency appears to be further reflected in the continued failure by the Baker administration to apply for the available grant funds for the program. As noted, the program will not be a small undertaking. DDS is also planning to establish a unit within the Department of specialists to review both state and federal information in order to determine, apparently on a case-by-case basis, whether each applicant or existing employee is suitable for employment. DDS is currently drafting regulations to govern these processes. Thus far, no additional funding has been allocated to DDS to implement the program. The 510,000 needed for the current year in implementation money has to come from somewhere. Why not take help when it’s offered?